The What Is Avatar? 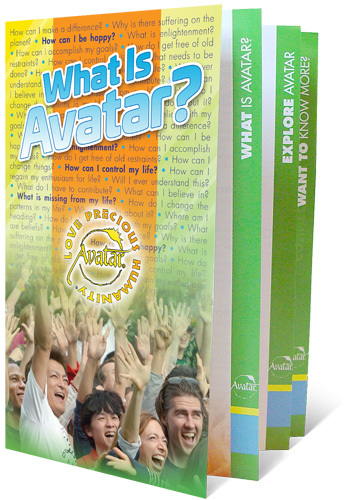 brochure is a full-color publication that answers the questions: What Is Avatar?, How Does Avatar Work?, What Makes Avatar Different?, Why Do I need Avatar?, What Can I Expect From The Avatar Course? Included are descriptions of Sections I, II and III, the Power Package and the Star's Edge websites, featuring TheAvatarTimes.com and the new AvatarReSults.com. There is also a blank area on the back page for you to include your personal contact information. The What Is Avatar? brochure is sold in packs of 50 brochures. New to Avatar and just want one of these brochures? click here. Rather than presenting you with another set of beliefs to live by, Avatar awakens you to a natural ability to create and discreate beliefs. With this skill, you can restructure your life according to a blueprint that you determine." Chinese, Dutch, English, French, German, Hebrew, Hungarian, Icelandic, Italian, Japanese, Korean, Macedonian, Norwegian, Polish, Portuguese-BR, Slovenian, Spanish, and Swedish.